Note: Three other grants to PI Gutschick (from here on, "I" or "me") are related closely to this work. Two of these are grants from DOE's Terrestrial Ecology Program (TECO) to Hormoz BassiriRad as PI, in which I am modelling plant responses to elevated CO2. This work is complementary to the main NIGEC work, which is primarily aimed at flux control in response to all environmental factors other than CO2. A third grant is the Jornada LTER grant to Duke University for long-term research on the Jornada Experimental Range at New Mexico State University (why Duke = NMSU? This is a long story not relevant here). For this grant, I am doing similar studies to those described here at the WLEF tall tower site, but on vegetation of semi-arid desertified grassland. The work focuses on population and community diversity in stomatal control and analyses of water-limited net primary productivity. Abstract: ur work deepens the plant-physiological interpretation of current CO2 and water vapor fluxes in major ecosystem types, while aiming at the most parsimonious data requirements. Cross-site comparisons (AmeriFlux and FACE sites) are strengthened by the physiological and ecological regularities in plant behavior that we elucidate, and the analysis extends to reciprocal effects between fluxes and regional water balance. From the experiments and theory we are seeing potent regularities in vegetation's physiological control of fluxes, to use in GCM's and in models of climate impact on ecosystems. The models of flux control are parsimonious, not requiring resolution of the many plant species that is beyond the capability of remote sensing to provide globally. The work ties together 6 sites nationally, of which 5 have long-term flux monitoring. On these sites, ability to scale fluxes from leaf to region will be enhanced, using models transferable among sites. Included in scaling is a test of km-scale variability, giving some very direct indications of how representative the flux-tower sites are of the larger regions. For scaling up CO2 and water-vapor fluxes from leaf to region, we propose that: (1) stomatal conductance follows the Ball-Berry or closely related patterns in all biomes; (2) leaf carboxylation capacity, to which conductance and fluxes scale, acclimates to the leaf's exposure history in light, temperature, N, water stress and CO2 in nearly-universal patterns; (3) CO2 and water-vapor fluxes scale from leaf to region in accord with measured and modelled distributions of microenvironments and with the acclimation patterns of carboxylation capacity; (4) the diversity in conductance and fluxes remaining outside these patterns has a simple ecological distribution. The action of vegetation as sink and water-vapor source is critical in understanding and predicting future climate, hydrologic regimes, crop and forest productivity, and attendant social impacts. For such predictions, models of climate, hydrology, and productivity on large scales must be parametrized largely with remote-sensing (RS) data. However, the diversity of plants as sinks and water-vapor sources is great, while RS data cannot hope to resolve plant species and stress status. It is profitable, then, to seek regularities in individual-plant physiological behavior, such as established in photosynthetic carboxylation rates (the now-classic model of Farquhar , 1980) and in regulation of stomatal conductances for water vapor and (Ball et al., 1987; Leuning, 1995; Dewar, 1995). A number of these physiological regularities are applied in current climate models (e.g., Ball-Berry stomatal control: Sellers et al., 1996), on the basis of selective tests on vegetation types. Our current work has been extending tests of hoped-for regularities, such as in stomatal control, to diverse biomes and physiological conditions. We propose continued, focused work on stomatal control.Vc,max. Regional conductance, evapotranspiration, and assimilation pose further challenges. First, all of these scale (if nonlinearly) to leaf photosynthetic capacity, Vc,max. Thus, Vc,max patterns must underlie the empirical patterns in conductance (Kelliher et al., 1995), which deserve deeper explanation in both experiment and in theory. We propose to test explanatory models of Vc,max patterns based on hypotheses that these patterns optimize long-term carbon gain. Second, the resulting robust models of leaf performance must be applied within the canopy's complex distribution of microenvironments. We propose stepwise tests of models (microenvironmental and physiological) from leaf to multi-km scales. This work will explicitly address the spatial variability of fluxes that is assessable in only limited fashion from fixed flux towers. (a) Hypothesis: Stomatal conductance follows the Ball-Berry or related patterns. In year-2 work proposed here, we would extend our work to two FACE sites, for stomatal control at elevated , and to important grasses on the semiarid Jornada Range. The strong modification of stomatal control, assimilation (A), and transpiration (E) by water stress has been a focus of our research. In year 2, we will continue measurements of responses. Additionally, we propose modelling that synthesizes hormonal responses (Tardieu et al., 1993) with the Ball-Berry model, plus some simple tests of distributed responses within plants. (b) Hypothesis: Leaf photosynthetic capacity Vc,max acclimates to long-term histories of major microenvironmental variables - leaf irradiance, temperature (T), water stress, , and nitrogen availability - to maximize long-term carbon gain of the canopy. Exceptions to the pattern should largely be restricted to minor canopy species with different, 'dependent' competitive strategies. Among other things, this optimization principle could broaden the physiological basis of the often-linear empirical relation between absorbed photosynthetically active radiation (APAR) and canopy assimilation (e.g., Myneni et al., 1992b) - a relation that is exploited in remote sensing and climate models. Results would be tested with data from 5 sites, four of which have long-term eddy-flux correlation measurements of and water-vapor fluxes on a km-footprint scale. Sub-hypotheses address the development of robust indicators (such as leaf relative water content) for long-term stress acclimation, as well as separating long- and short-term temperature responses. (c) Applying these results at the stand level, we propose to test: Hypothesis: assimilation and evapotranspiration scales to branch, plant, stand, and regional levels in accord with the modelled and measured distributions of microenvironment on leaves. Both field experiments and models would be used to test this scaling. Additional phenomena at larger scales, such as soil evaporation and canopy boundary-layer development, would be measured and modelled. To resolve which physiological (and micrometeorological) features explain the most variance in observations, we would develop models of observed fluxes in a hierarchy, from simplest (e.g., big-leaf models with Ball-Berry stomatal control, etc.) to more complex. (d) Notwithstanding some important physiological regularities, plants do exhibit remanent diversity in stomatal control, A, and ET. We therefore propose to test: Hypothesis: Strong ecological regularities exist; that is, the remanent diversity in plant regulation of , A, and ET is distributed about conservative means in a community; these means are set by a few, simple long-term climatic indices. At the WLEF tower AmeriFlux site, we will do short-term measurements of the spatial variability of fluxes and analyze them for consistently with the above hypothesis, as well as for relation to measured variations in cover and physiology. Using all the above hypotheses, we would test parsimonious models of canopy fluxes, growth, and soil hydrology against data in highly-instrumented test-beds, such as Reddy et al. (1995) employ in -exposure tests on cotton. We investigate stomatal control in response to the microenvironment of diverse leaves in a stand, using (1) gas exchange, both in closed- and open-flow (steady-state) modes and (2) detailed characterization of leaf microenvironments (air temperature and humidity, shortwave and thermal infrared flux densities, windspeed, CO2 concentration), measured locally at the leaf or modelled from top-of-canopy conditions. In the Chequamegon-Nicolet National Forest / WLEF tower site, we access the leaves primarily from a boom lift (Fig. 1). Fig. 2 shows our leaf cuvette emplaced on an oak leaf at 15 m height. The gas-exchange system is a highly modified LI-COR LI-6200 system, joined to a PP Systems cuvette (with all electronics swapped out for our custom electronics) and a Peltier temperature controller (also custom-made) to control leaf temperature. Here, the effect of the environment is subsumed into the single index A hs/Cs, where A = CO2 assimilation rate (which has a well-characterized response to temperature, internal CO2 concentration, and photon flux density in the 400-700 nm range, or PAR), and hs and Cs are, respectively, the relative humidity and CO2 concentrations at the leaf surface, beneath the leaf boundary layer. Figure 1: Boom lift (24m) used to gain access to leaves in canopy at Willow Springs study site, Chequamegon-Nicolet National Forest. Figure 2: Performing measurements of gas exchange on an oak leaf (Quercus rubra) at 15m height in the canopy. Figure 3: Adherence of measured stomatal conductance (gs) to Ball-Berry model. Line Aslope = 10" is postulated universal fit, as observed in several other biomes. Figure 4: Temperature dependence of inherent carboxylation capacity (caled to universal 25o C). Fall off at high temperatures is sharp. Results for 4 leaves are shown in Fig. 3. The fit is good, which helps in establishing near-universal patterns of stomatal control for our large objectives. The fit also aids us in modelling fluxes at the WLEF tower specifically, including midday depressions from lowered relative humidity (and high leaf temperatures: see below). Our 1998 field campaign will sample other important tree species, including conifers. (2) How is leaf carboxylation capacity, , set by long-term leaf microenvironment (histories of irradiance, temperature, etc.) and by immediate temperature? The short-term effect of temperature is expected to be (a) exponential activation, merging into (b) rapid thermal deactivation above a critical temperature that is near the extreme high experienced by the leaf. The deactivation may also be important in contributing to midday depression of fluxes on some days. If the thermal activation (item a) is properly described by an Arrhenius model, then at any temperature can be scaled back to a virtually invariant value at a reference temperature (say, 25oC), until the leaf temperature exceeds a threshold for membrane stability. This is seen cleanly in 3 of the 4 leaves (Fig. 4). The goal we seek is producing mechanistic models of conductance, assimilation, and transpiration that are transferable among species, sites, and various altered climates. The models, such as for leaf carboxylation capacity as controlled by leaf microenvironmental history, are only derivable and testable at the leaf levels...while the principal test of their generality and their significance in climate and climate impacts is in scaling up to large regions. Scaling up requires not only technologies to measure fluxes on different time and space scales. First, the microenvironments of leaves, and of single plants within a stand, and of small regions within a large region are distributed rather than uniform. Leaves on a plant are displayed at different angles and at different optical depths, temperatures, etc. We must know these distributions. Initially, comprehensive sampling is required but it should be directed to verifying generalizable models; we cannot afford to sample the light environment on all leaves in a forest, but we can model it from top-of-canopy incident fluxes and canopy structure. This first challenge then becomes a twofold challenge of verifying models of microenvironment distribution and of integrating leaf (or plant or region) performance over this distribution. Second, new phenomena emerge at higher scales. Going from plant to stand, we encounter soil evaporation not directly related to plant transpiration. We also encounter the canopy boundary-layer resistance to transport of , WV, and heat, acting essentially in series with stomatal resistances and leaf boundary-layer resistances. We must measure these new phenomena on each scale. Temporal scales act similarly. The history of temperature and water stress on a leaf induces acclimation in leaf carboxylation capacity, leaf area development, etc., that is largely unrelated to instantaneous effects of these environmental variables. Consequently, the most valued studies of fluxes cut across spatial and temporal scales. On the regional level, a model study for us is Monsoon 90 (Stannard et al., 1994) on a semiarid rangeland rather similar to our Jornada Range. Our proposed work is aimed to provide greater depth in the physiology at the leaf scale, in particular. 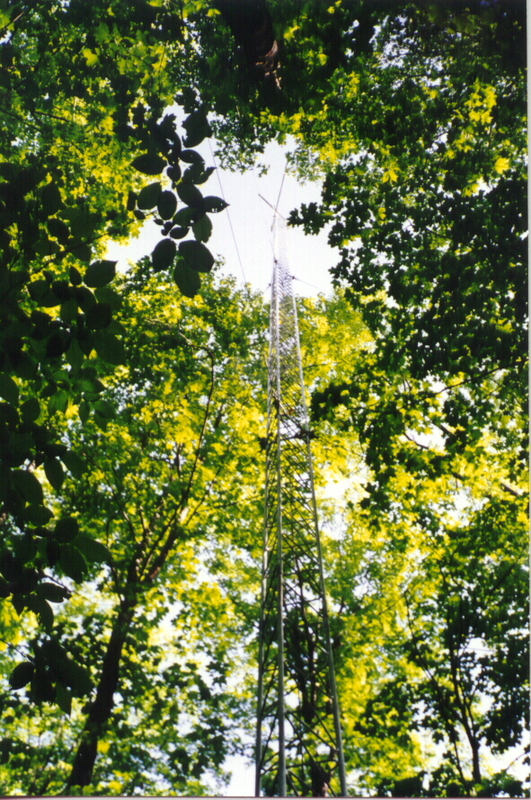 Scaling is a major effort at the valuable long-term flux sites such as the Harvard Forest (Waring et al., 1995; Amthor et al., 1994), Walker Branch (Baldocchi and Harley, 1995), and the WLEF tower. Our goal with these sites is to test cross-site generality of physiological models and to test how parsimoniously the larger-scale models can be compounded from smaller-scale models. We seek explicitly to avoid the hazards of errors and low interpretability of complex models (Monteith, 1996; Vogel et al., 1995). Our 1996 and 1997 results at WLEF include surveys of canopy structure for light propagation. The leaf angle distribution was highly planophile at all lower levels in all major species (oak, maple, etc. ), whether one sampled regenerating saplings in gaps, regenerating saplings in the understory, or lower leaves of mature overstory trees. At the top of the canopy, the LAD turned to a nearly uniform distribution (random angles), for approximately the top two units of leaf area index. This pattern is highly adaptive for effective use of biomass invested in leaves to caputre light. It makes modelling of light interception a bit more complex, but not much. An important parameter in light penetration is the degree of leaf clumping - that is, deviations from the zero-order hypothesis that leaf centers are distributed randomly in space. With this assumption, light attenuation follows the law (fractional penetration) = exp(-K*L), with L being the cumulative leaf area index to the chosen depth in the canopy and K being the attenuation coefficient. K is computed as (mean fractional area of leaf presented along view direction, that is, mean cosine of the angle between leaf normal and view vector) / (cosine of view angle, to correct for optical path being longer than vertical path for off-nadir views). When leaves are clumped, a "binomial distribution" of light penetration is mandated, with a clumping length D, such that fpen = (1 - K*D)**(L/D). This approximates the exponential form when D is very small. The formula nominally applies to discrete layers only. I have modified it (Gutschick, 1991) so that one applies the exponential form to L as a continuous variable, but one corrects K as K0*ln(1-K*D)/(K*D) = ln(1-K*D)/D. To get D for this calculation, one can either measure actual L and actual fpen, which means harvesting a lot of leaves, or one can independently assess the degree of clumping. We did photographic surveys of the overlap of leaves within branches. We will process these to get overlap. The immediate result is that, within a branch, leaves are overdisperse, the opposite of clumped. I estimate that D is large and negative, about -0.5. This would give a much lower fpen for a given LAI than would unclumped leaves. We will use this analysis in modelling light interception within branches, such as in our modelling of the sapflow results. However, on the scale of the whole tree and its near neighbors, the branches are clumped, so that fpen to the understory is larger than expected for a given LAI (and leaf angle distribution). Our analyses of light interception on top-of-canopy oak and maple leaves are proceeding. We selected 13 maple leaves and 16 oak leaves, on branches on which we had sapflow gauges, and placed photodiodes on the center of each leaf. The leaves were selected to sample a full range of leaf orientations (azimuths) and layer placement. We will analyze the light distribution with several models of increasing complexity. We measured water flux at the branch level on one oak and one maple tree, using sapflow gauges (Senock and Ham, 1993) and our novel circuitry for sensor readout and datalogging (Figs. 5,6). Concurrently we measured light interception on 28 leaves with photodiodes (updated technology of Gutschick et al. , 1985). We are comparing measured sapflows to branch ET models that vary in comprehensiveness of describing microenvironmental distributions and stomatal behavior. Figure 5, 6, 7 (left to right): Sapflow gauges being emplaced on an oak tree; single board computer (DominoTM) in controller and datalogger; complete system hanging in tree at 20m height. We will be doing surveys of stomatal conductance (for its fit to the Ball-Berry and related models) and of leaf carboxylation capacity. The surveys will extend to species not covered in 1996 and 1997, particularly conifers. We will also seek patterns of acclimation of carboxylation capacity (Vc,max) to variations in leaf microenvironment (by height, exposure, etc. within a stand; by soil N and temperature differences between stands). Perhaps in 1998, but more likely in 1999, we plan to extend the study of photosynthetic gas exchange to quantifying the degree of photosynthetic downregulation (also called photoinhibition). Under stresses such as water stress, plants reduce their photosynthetic electron-transport capacity below the level predicted from acclimation / optimization models. We have begun a collaboration with John Gamon, of the California State University, Los Angeles, to deploy his sensors measure leaf reflectivity at 531 and 570 nm. The reflectance ratio is deemed the photochemical reflectance index, or PRI, and it is linearly related to the degree of downregulation. Applying the technique to monitoring whole canopies requires modelling of the downregulation process and of the propagation of radiation in the canopy, both of which we have begun. The effort to measure PRI will depend on obtaining funding, which will be sought from NASA. We will perform more measurements of branch sapflow, for longer terms (up to 2 weeks). We also hope to deploy a branch chamber, courtesy of Joe Berry of the Carnegie Institution, Stanford, to measure both CO2 and water-vapor fluxes from whole branches (especially conifer tops). On larger scales, we plan a campaign to quantify differences in water-vapor and sensible-heat fluxes between sites, using tethered balloons to carry our instrumentation. The motivation is that water-vapor fluxes have been observed to vary several-fold between sites in a nominally homogeneous vegetation stand (D. Cooper, pers. commun. and in press). This makes it important to know how representative a long-term flux tower site is of the whole region. We will use the aerodynamic method, sampling windspeed, temperature, and humidity at 4 heights above the canopy. A requisite for understanding larger-scale fluxes in terms of vegetation amount and physiology is quantifying the amount of vegetation, as leaf area index, and also the species composition. We plan to do aerial photography of select sites. We will the use image analysis to quantify leaf area index, using pixel-wise classification into leaf, non-leaf, and mixed pixels. The fraction of leaf in view will be related to LAI with models of canopy structure and light penetration. For species composition, we plan to extend analyses underway on the Jornada Range. In these studies, we process a subimage containing one plant, to derive spectral measures (mean hue, saturation, value, etc.) and spatial measures (autocorrelation functions of greenness, etc.). These measures are provided to a neural network trained to identify species. J. S. Amthor, M. L. Goulden, J. W. Munger, and S. C. Wofsy. 1994. Testing a mechanistic model of forest-canopy mass and energy exchange using eddy correlation: carbon dioxide and ozone uptake by a mixed oak-maple stand. Aust. J. Plant Physiol. 21: 623-651. D. D. Baldocchi and P. C. Harley. 1995. Scaling carbon dioxide and water vapour exchange from leaf to canopy in a deciduous forest. II. Model testing and application. Plant Cell Environ. 18: 1157-1173. J. T. Ball, I. E. Woodrow, J. A. Berry. 1987. A model predicting stomatal conductance and its contribution to the control of photosynthesis under different environmental conditions. In: Progress in Photosynthesis Research, ed. J. Biggins. M. Nijhoff Publishers, Dordrecht. Vol. 4, pp 221-224. R. C. Dewar. 1995. Interpretation of an empirical model for stomatal conductance in terms of guard cell function. Plant Cell Environ. 18: 365-372. G. D. Farquhar, S. von Caemmerer, and J. A. Berry. 1980. A biochemical model of photosynthetic CO2 assimilation in leaves of C3 species. Planta 149: 78-90. V. P. Gutschick. 1991. Joining leaf photosynthesis models and canopy photon-transport models. In: Photon-Vegetation Interaction: Applications in Optical Remote Sensing and Plant Ecology, eds. R. B. Myneni and J. Ross. Springer Verlag, Berlin. Pp. 501-535. V. P. Gutschick, M. H. Barron, D. A. Waechter, and M. A. Wolf. 1985. Portable monitor for solar radiation that accumulates irradiance histograms for 32 leaf-mounted sensors. Agric. Meteorol. 33: 281-290. F. M. Kelliher, R. Leuning, M. R. Raupach, and E.-D. Schulze. 1995. Maximum conductances for evaporation from global vegetation types. Agric. Forest Meteorol. 73: 1-16. R. Leuning. 1995. A critical appraisal of a combined stomatal-photosynthesis model for C3 plants. Plant Cell Environ. 18: 339-355. J. M. Monteith. 1996. The quest for balance in crop modeling. Agron. J. 88: 695-697. R. B. Myneni, B. D. Ganapol, and G. Asrar. 1992b. Remote sensing of vegetation canopy photosynthetic and stomatal conductance efficiencies. Remote Sens. Environ. 42: 217-238. V. R. Reddy, K. R. Reddy, and H. F. Hodges. 1995. Carbon-dioxide enrichment and temperature effedts on cotton canopy photopsynthesis, transpiration, and water-use efficiency. Field Crops Res. 41: 13-23. P. J. Sellers, L. Bounoua, G. J. Collatz, D. A. Randall, D. A. Dazlich, S. O. Los, J. A. Berry, I. Fung, C. J. Tucker, C. B. Field, and T. G. Jensen. 1996. Comparison of radiative and phsyiological effects of doubled atmospheric CO2 on climate. Science 271: 1402-1406. R. S. Senock and J. M. Ham. 1993. Heat balance sap flow gauge for small diameter stems: technical report. Plant Cell Environ. 16: 593-601. D. I. Stannard, J. H. Blanford, W. P. Kustas, W. D. Nichols, S. A. Amer, T. J. Schmugge, and M. A. Weltz. 1994. Interpretation of surface flux measurements in heterogeneous terrain during the Monsoon '90 experiment. Water Reso. Res. 30: 1227-1239. F. Tardieu, J. Zhang, and D. J. G. Gowing. 1993. Stomatal control by both [ABA] in the xylem sap and leaf water status: a test of a model for droughted or ABA-fed field-grown maize. Plant Cell Environ. 16: 413-420. C. A. Vogel, D. D. Baldocchi, A. K. Luhar, and K. S. Rao. 1995. A comparison of a hierarchy of models for determining energy balance components over vegetation canopies. J. Appl. Meteorol. 34: 2182-2196. R. H. Waring, B. E. Law, M. L. Goulden, S. L. Bassow, R. W. McCreight, S. C. Wofsy, and F. A. Bazzaz. 1995. Scaling gross ecosystem production at Harvard Forest with remote sensing: a comparison of estimates from a constrained quantum-use efficiency model and eddy correlation. Plant Cell Environ. 18: 1201-1213.